The material value alone is often extensively, but the underlying value of jewellery is always much higher, and sometimes boundless. Jewellery has its own story to tell; perhaps it is an antique inherited from a loved one, a present received on a special occasion, or simply an item purchased as a reward for an exceptional success, so the theft of rings, bracelets, necklaces and watches is always a particularly hard personal blow. Nothing can ever replace the memories linked with an individual item of jewellery, no amount of insurance compensation can make up for the loss of such a priceless piece. 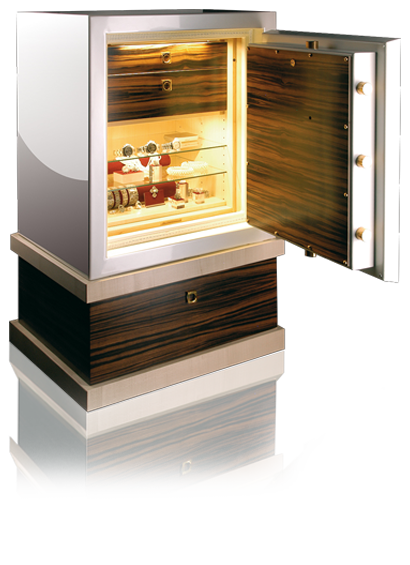 The perfect safes for insightful customers with exclusive tastes are the jewellery safes from the premium line “Signature Safes by HARTMANN” that represent the highest level of luxurious, chic security. Looking back at over 150 years of traditional craftsmanship, HARTMANN TRESORE became one of the leading suppliers for safes in Europe and the Middle East after making the decision to specialize in safes in 1983. The high-end brand “Signature Safes by HARTMANN” links outstanding security with individuality. "Signature Safes" are safes, which are thoroughly manufactured according to the peculiar desires and expectations of the customers, often for the protected storage of watches and jewellery. With our jewellery safes you are not compromising, neither in terms of external appearance nor of interior fittings and fixtures. Whether thoughtfully in concealed locations or as an attractive yet secure, visible art piece integrated in the interior décor of a house, these jewellery safes can be installed anywhere. In case you would prefer to exhibit your safe as a piece of modern household furniture, jewellery safes from HARTMANN provide you with a world of new possibilities. The customer’s personal style is crucial – the exterior can be elegant, glossy black or an exquisite, subtle shade of cream. Virtually any color is possible. Even pink or multi-colored patterns are possible alternatives. To blend in with the rest of the furniture in your home the safe can be covered with leather or cladded with hardwood. Furthermore, the fittings and locks are variable too - gold plating is available on request. The safe can be modern and chic or have a retro vintage look – a limitless world of possibilities! The same also counts for the interior of your jewellery safe. A broad selection of hardwoods is available for the fittings – mainly drawers, which can also be combined with open shelves. The drawers can be coated with luxurious felt or leather, but also with velvet or Alcantara. You can choose the material from an almost limitless range to ensure the best protection for your jewels and to accentuate them. Of course, when choosing a safe security is clearly always the main priority. Despite their individuality and exclusiveness, jewellery safes from the “Signature Safes by HARTMANN” line is no exception. All safes are tested and certified to highest European standards. Moreover, they can be equipped with components to enable connection to an electronic home security system. However, to prevent burglary the safe must be securely anchored. The smaller and lighter the safe, the more important it is for it to be strongly anchored. The choice of lock is also decisive: electronic locks offer the advantage of having no keys that need to be kept in a safe spot. One of its useful additional functions is a time delay which can be installed to ensure that the door cannot be opened until a certain period has elapsed after entering the code. The biometric fingerprint locking system is an easy, comfortable solution that offers top-level security: merely swipe your finger across a scanner to open your jewellery safe. It will be a pleasure for us to advise you about which system is the best for your requirements. A personal, customized jewellery safe is not only a safe place to keep your valuable jewellery, but also an expression of your individual style. Safes of this type do no longer be kept in a dark corner, but instead intentionally set up as the center point of an office, living room or bedroom. Usually, customers who take this option want the safe to accord with the style of their other furniture and décor. Could it by any chance that your jewellery collection consists of extraordinary individual items that you would like to keep on permanent display? If so, by using armored glass doors your safe could turn into a display cabinet. A bulletproof glass safe adds an entirely new dimension to any dressing room! Whatever the exterior of your jewellery safe looks like, the interior fittings will be adjusted to comply with your collection and your wishes. Drawers with ring racks and lots of small compartments might be in favor of customers with many rings. As expected, special compartments for bracelets, ear rings, cuff links and other items are also available. Owners of Tiara require more space between compartment dividers, and clients with precious watches might need some space for one or more watch winders. A special inner safe-within-a-safe can also be installed, if you have one outstanding item with a remarkable value. Drawers can be made entirely of wood, or equipped with glass fronts or bottoms and LED lighting will present your valuables to the best possible effect. Since the configuration possibilities are almost unlimited your jewellery safe is adjusted to your customized requirements, wishes and ideas – down to the smallest detail. Before contacting us for designing your own individual jewellery safe, an inventory of your collection is of avail. The inimitable jewellery safes from our deluxe brand “Signature Safes by HARTMANN” are custom-made and individually equipped to adapt oneself to your requirements and desires. If desired, we also tender professional delivery, installation and anchoring of your safe. As part of our after-sales service, we will be more than happy to answer any questions about your “Signature Safe” even long after your purchase. Keep your sumptuous jewellery secured in a extravagant jewellery safe that has been individually designed to suit your requirements. The HARTMANN jewellery safe is the ideal way to secure your most precious items and valuable mementoes as it links banner security, stylish design and convenient care and storage. At last, jewellery represents much more than its material value alone. Our photo gallery may help to further inspire you for designs and fittings of your own individualized jewellery safe. In case you already have some ideas, please feel free to share them with us as we look forward to creating your own eminently individual jewellery safe together with you. Beauty and security are not a contradiction. We will prove it to you. To design your individual jewellery safe, we harmonize your wishes with technical security aspects. Security you can rely on! In accordance with EN 1143-1 standards, all our jewellery safes have been tested and certified by autonomous certification institutes. Your customized jewellery safe with special compartments for your rings, necklaces and colliers will be designed and built according to your wishes and requirements.